Near the village is the Commando Training Centre Royal Marines (CTCRM), the principal military training centre for the Royal Marines. The training centre has its own dedicated railway halt, Lympstone Commando (not in public use), on the Exeter–Exmouth branch line. Ralph Lane, equerry to Queen Elizabeth I, was born in Lympstone. He was a soldier who went with Sir Walter Raleigh on his second expedition to the New World in 1585. He founded a colony on Roanoke Island amidst great hardship and deprivation. He was later present at the defeat of the Spanish Armada. Singer and lead guitarist of The Kinks, Dave Davies, lived in Lympstone in the 1990s. Former Tottenham Hotspurs footballer Steve Perryman currently resides in Lympstone. Lympstone AFC were formed in 1906, they have sides in the Devon & Exeter Football League. Lympstone has a non-league football club Royal Marines A.F.C. who play at Endurance Park CTCRM. They have since folded in April 2012. The Exeter–Exmouth cycle route passes through the village. The cycle route is popular for commuters and recreational cyclists. Prior to the opening of the cycle route the only direct route to cycle between Exmouth and Exeter was along the busy A376. The cycle route passes through the centre of the village bringing custom to the shop, cafe and pubs and adds to the vibrancy and sustainability of the village centre and its businesses. Despite this, a minority group is currently campaigning to change the route and are concerned it affects the village centre and could be made safer for users and villagers. The 1st Lympstone Sea Scouts Group celebrated its centenary in 2012. It currently has flourishing Scout and Cub sections. It meets in the Scout HQ on Cliff Field. Lympstone Manor is an historical house which now provides hotel and restaurant accommodation. ^ "St Peter's Preparatory School". stpetersprep.co.uk. Retrieved 30 November 2018. ^ Burke's Peerage, Baronetage & Knightage, 107th edition, volume 2, 2003. pages 2721–2731. ^ "Debrett's Peerage, Baronetage, Knightage, and Companionage". Kelly's Directories, 1973 – Gentry, page 781. Retrieved 14 March 2018. Smith, Rosemary (2005). The Lympstone Story (Revised and Updated ed.). 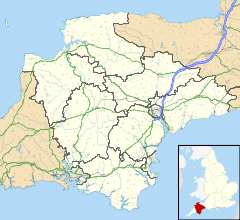 Lympstone, Devon: The Lympstone Society. ISBN 0-9504102-2-5. Wikimedia Commons has media related to Lympstone. This page was last edited on 30 November 2018, at 16:12 (UTC).